FIELDSTONE CABINETRY HAS YOUR PERSONALITY COVERED! 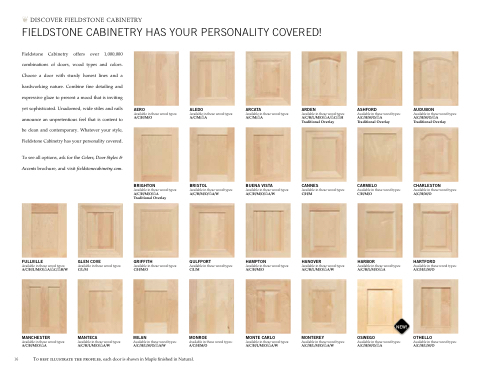 Fieldstone Cabinetry offers over 900,000 combinations of doors, wood types and colors. Choose a door with sturdy honest lines and a hardworking nature. Combine fine detailing and expressive glaze to present a mood that is inviting yet sophisticated. Unadorned, wide stiles and rails announce an unpretentious feel that is content to be clean and contemporary. Whatever your style, Fieldstone Cabinetry has your personality covered. To see all options, ask for the Colors, Door Styles & Accents brochure, and visit fieldstonecabinetry.com. To best illustrate the profiles, each door is shown in Maple finished in Natural.